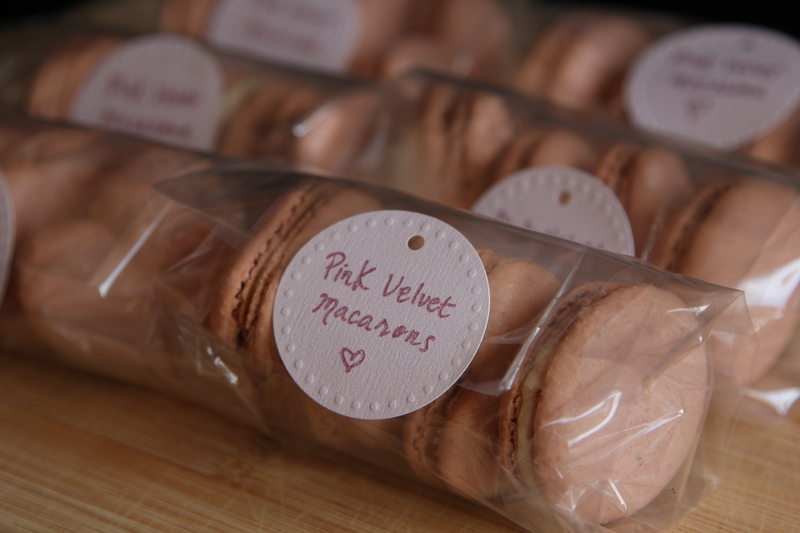 Pink Velvet Macarons [recipe] – Cin Cin, Let's Eat! 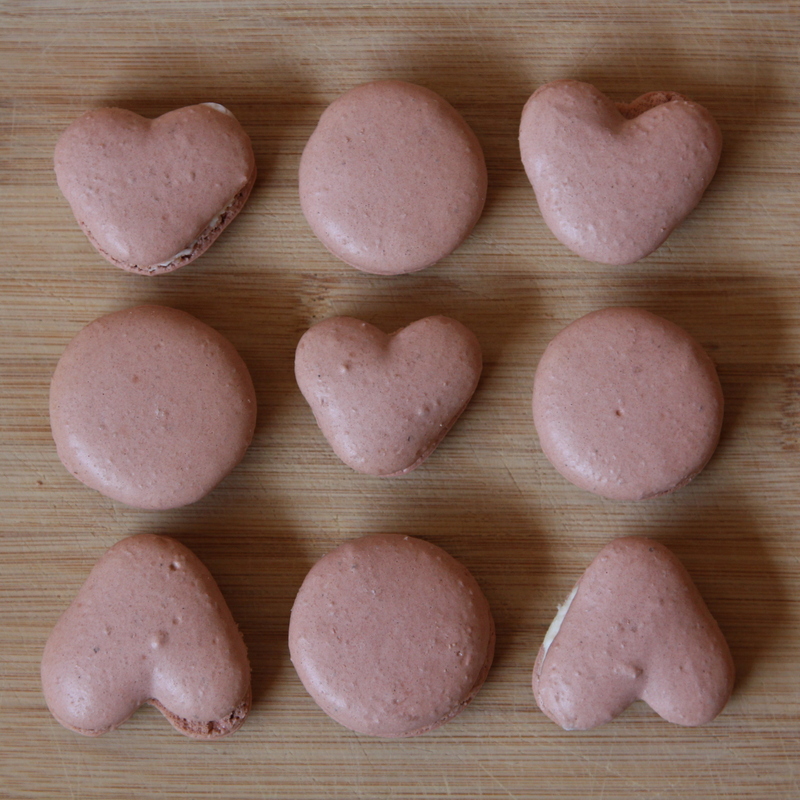 Going through the latest William Sonoma catalogue, I spied the cutest macarons, heart-shaped ones! You all know my obsession with making and eating macarons. These delicate treats are so tedious and time consuming but when a batch comes out of the oven with perfectly raised feet, it’s the most rewarding feeling! So I had this idea to make pink heart-shaped macarons and give them out to all my loved ones for valentine’s day, and here is when my 4-day battle with macarons began. I had my mind set on either strawberry or red velvet flavor, and decided on the latter. I tried out a new recipe from Les Petits Macarons and followed the instructions very carefully, but I could tell immediately the batter seemed off. Kathryn Gordon also used a very unique method that I haven’t seen anywhere else- Instead of letting the macarons rest and dry for at least 30 minutes to an hour, she put the tray in the oven on the lowest setting for 15 minutes to dry out the shells, then turn up the heat to 350F to finish baking. Anyway, batch #1 didn’t have any feet and immediately deflated when I pull them out of the oven. The flavors were good and the texture was slightly chewy, not bad actually. If only they looked better. The troubleshooting guide in the back of the book indicated that macarons without any feet after baking is a sign of insufficient granulated sugar. I have also heard that if the shells are not dried, then they will not rise either. For batch #2 I added a little bit more sugar, but ended up with the same ugly looking shells like batch # 1. Frustrated, but refused to give up. I made another batch on day 3. This time I decided to not use the oven method to dry out the shells, instead I let them air dry. It must be very humid in my house because it took almost 3 hours for them to dry. I also had no luck with this batch. You can imagine at this point I was pretty pissed with myself. What am I doing wrong? Everyone online seems to be having good luck with the recipes from the book. 2. Once fold in the dry ingredients to the egg whites, Cover the mixture and let it rest for 30 minutes to an hour. This makes sense because I usually pipe and bake one tray at a time, and by my third tray of macarons the batter has the perfect consistency and the baked shells have the shiniest flat coat. *It’s essential to age egg whites for macaron-making. This reduces moisture in the whites and will ensure good elasticity in the whites, producing a great and stable meringue. I generally separate the whites at least 1 day in advance, keep covered in an airtight container in the fridge. Take them out a few hours prior to using so they can come to room temperature. 1. Line baking sheets with Silpat silicon mats or parchment paper. (I strongly suggest every bakers out there to invest in some wonderful Silpat, they are the best!) If you want to use a template, draw 1″ circles on two sheets of 8.5×11″ paper, place them under parchment or the Silpat. Once you are done piping, the template can be easily taken out from either side. 3. Whisk egg whites and cream of tartar with a wire whip attachment on medium speed. Once foaming, gradually add in the granulated sugar. Once all the sugar is incorporated, scrap down the sides of bowl and whisk on high speed until glossy and firm peaks form. (The meringue should stay in the bowl if you hold the bowl upside down). Add in vanilla and the red food color, beat until incorporated. 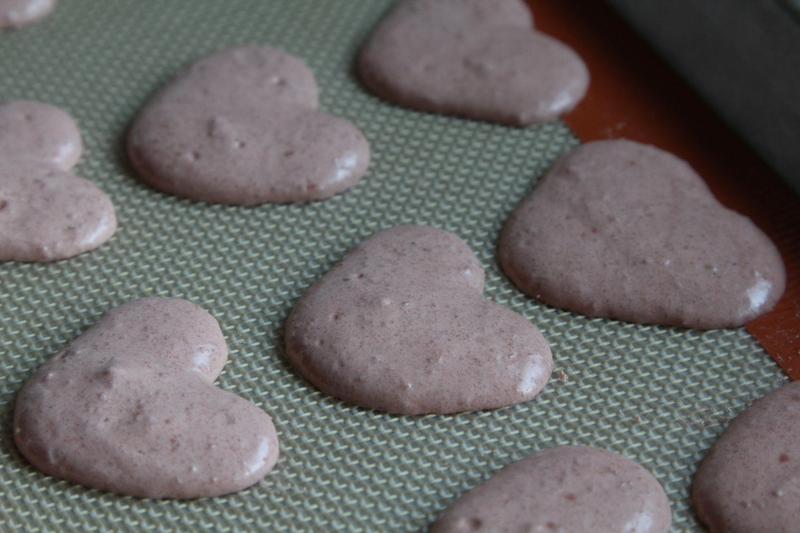 4. the macaronnage step: add 1/3 of the almond flour mixture at a time to the meringue. Using a silicone spatula, do a J-fold – Take the spatula straight down the center of the meringue, scrape then bring the bottom to top, like you are writing a “J”. Rotate the bowl 90 degrees and repeat. Mix until the batter is smooth and shiny, do no more than 50 strokes.The batter is done once it drips down slowly in a steady stream yet is still nice and firm. 5. Transfer the batter to a pastry bag fitted with a plain round tip. (if you don’t have a piping tip, simply snip the pastry bag to a 1/2″ opening. The trick is to do a very clean cut or you will end up with odd shape circles.) Hold the bag perpendicular to the baking sheet and pipe 1″ (or bigger if you desire) rounds. 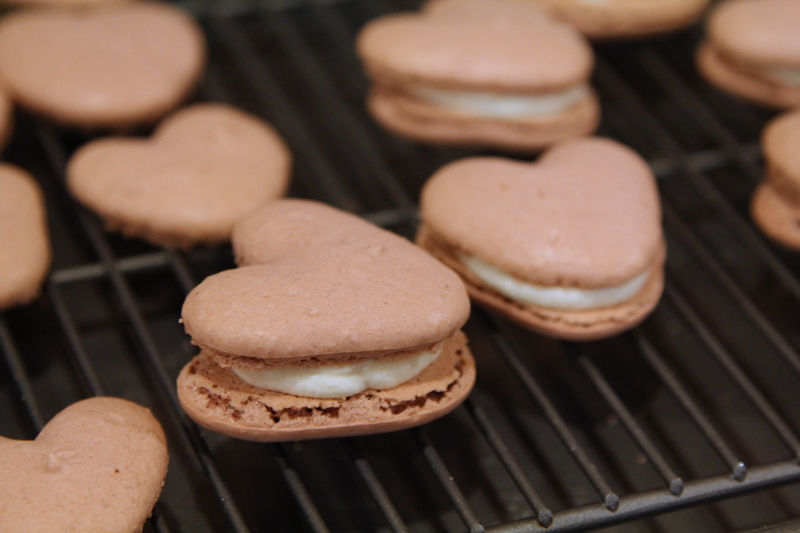 For heart-shaped macarons, I simply piped a “V” shape. 6. Rap bottom of each sheet on your counter or any flat surface to release trapped air. This is very important because it’ll also get rid of the ugly tip that’s often left on the piped shells. Let these stand at room temperature for 30-60 minutes until they no longer stick to your finger when lightly touched. Depending on the humidity, I’ve had macarons that took a couple hours to dry. 7. Preheat oven to 325F with the rack set at the lowest level. Bake one sheet at a time for about 14-16 minutes. If the shells start to get brown at the edges, lower the temperature for your next batch. 8. 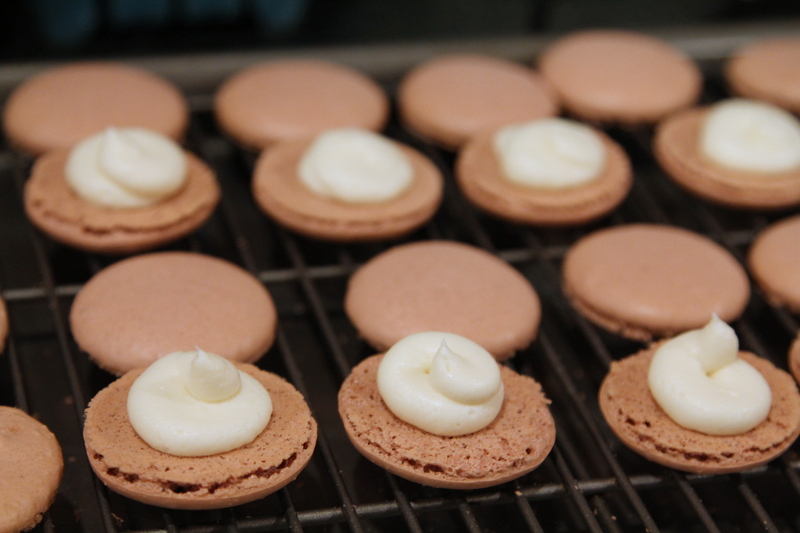 Let macarons cool on baking sheet for 5 minutes. Once slightly cooled, they should come off the Silpat or parchment cleanly. 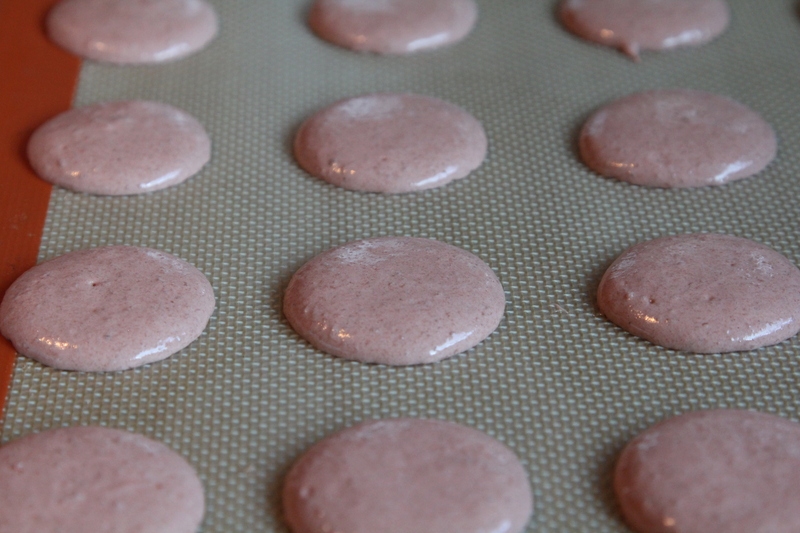 (A great way to help release the macarons is to take a spray bottle with water, as soon as the tray is out of the oven, lift the Silpat/parchment paper and spray some water. 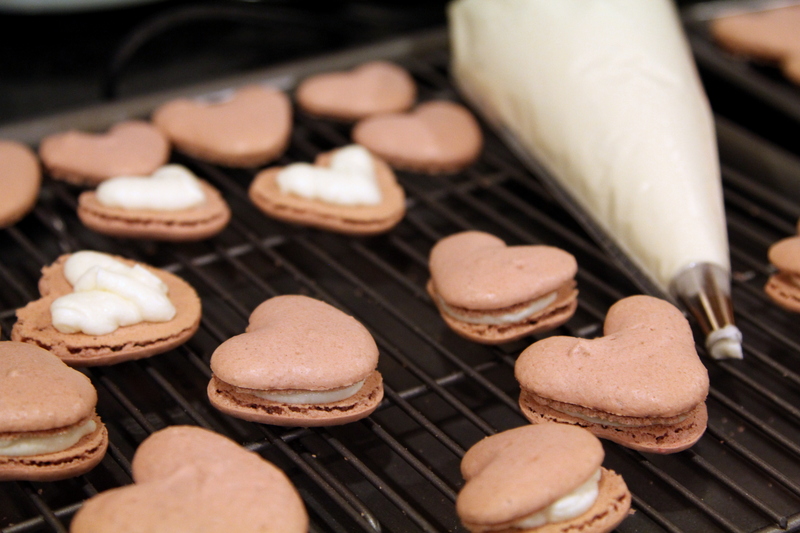 The steam helps with releasing the macaron shells.) Transfer to a wire rack to cool completely before filling. With a paddle attachment, beat cream cheese and butter on medium until fluffy. Add the remaining ingredients and beat on high for 3-4 minutes. Transfer to a pastry bag for piping or you can simply use a butter knife or spoon to fill the macarons. These macarons tasted especially delicious once refrigerated. I wrapped them up in treat bags and gave them out as belated Valentine’s day treats. 2 days late, but I think the taste made up for it! These look great! My wife loves macarons so I will be attempting this one some day! OK, those are just really darn cute! 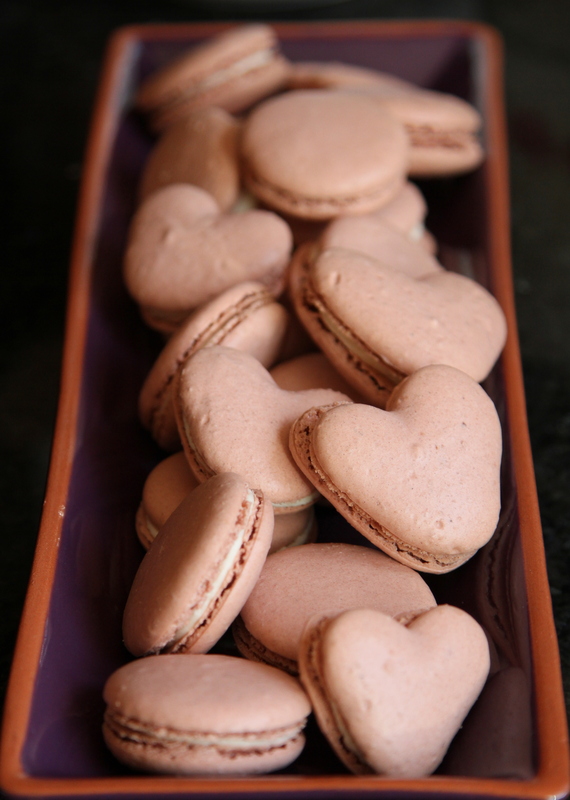 this year i felt really loved on valentine’s day, thanks for the wonderful treat, one of your best macarons!!!! Pingback: Carbonara Pasta [recipe] « Cin Cin, Let's Eat!